I woke up with the sun again this morning to a canopy of mosquitoes staring down at me from the other side of my tent’s mesh. The morning quickly warmed up as I lay there looking up at the pests until it was too warm for me to stay in the safety of my tent. It wasn’t long after climbing out of the tent before I felt the first bite. I gathered up my cooking supplies and made my way to a nearby sunny rock overlooking the lake. Direct sun made for a hot start to the day, but it kept the mosquitoes down to a manageable level. After breakfast we hit the trail. It was 9:30AM and the temperature was already approaching 90°F as we made our way up an exposed granite face towards the ridge. This was the last major climb of the trip. Crossing the ridge brought us into another stretch of forest recovering from fire. 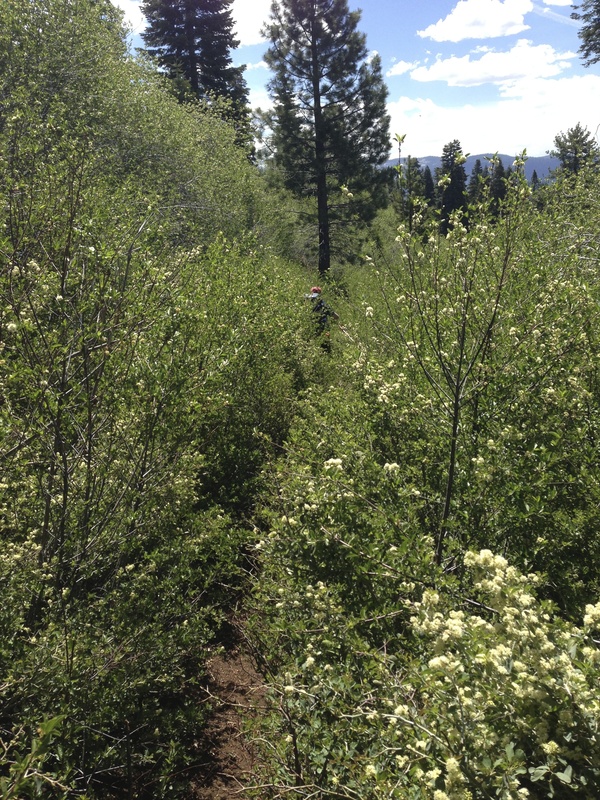 The chaparral was above head level and the trail was in serious need of maintenance. The hiking turned into bushwhacking. 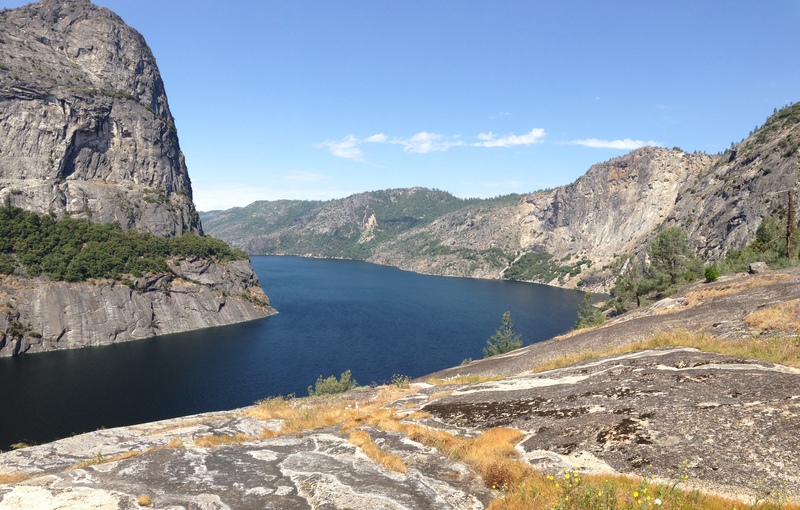 As we descended through the chaparral we were giving some beautiful views of Hetch Hetchy Reservoir Valley. We descended down a long series of switchbacks into Tiltill Valley. We stopped here for lunch and a water refill. It was about 1PM and I had already burned through most of my 3.5L supply. I also took the time to rinse off the thick layer of dust that coated my face. The water was cold and refreshing. As we packed up from lunch we heard a faint rumble of thunder in the distance. After a few more rumbles we determined that the storm was heading in our direction. 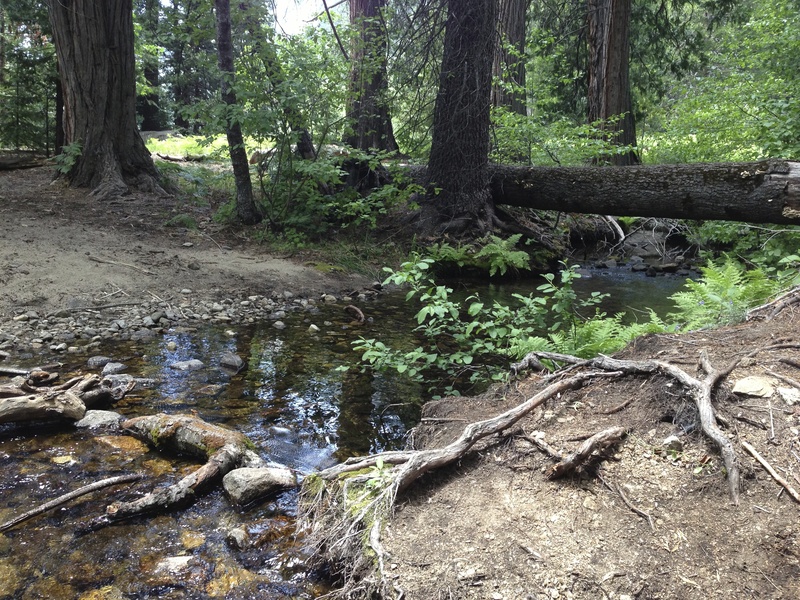 The map showed the trail moving into more exposed terrain, so we decided to make camp here at Tiltill Creek rather than risk being caught on open granite. With my tent up, I climbed in just as the first rain drops began to fall. It was quite warm in the tent, but with thunder cracking over head, I thought we had made the right choice. The storm was louder than wet. The wind picked up as the thunder carried on and the drizzle stayed heavy enough to keep us in the tents. This continued for a couple hours, but by 5:30PM the wind died down and the sky cleared up just in time for a spectacular sunset! The mosquitoes made it another early night. 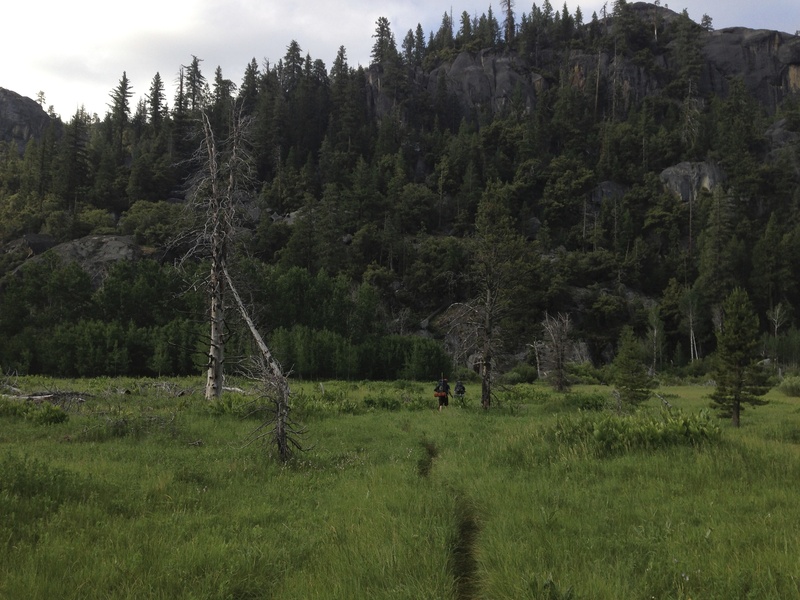 I was hopeful that they would stay in the high country as we descend to the reservoir the next day. The sun returned early the next morning bringing with it mosquitoes and humidity. We took care of breakfast and packing up camp quickly. This was probably the worst morning of mosquitoes. 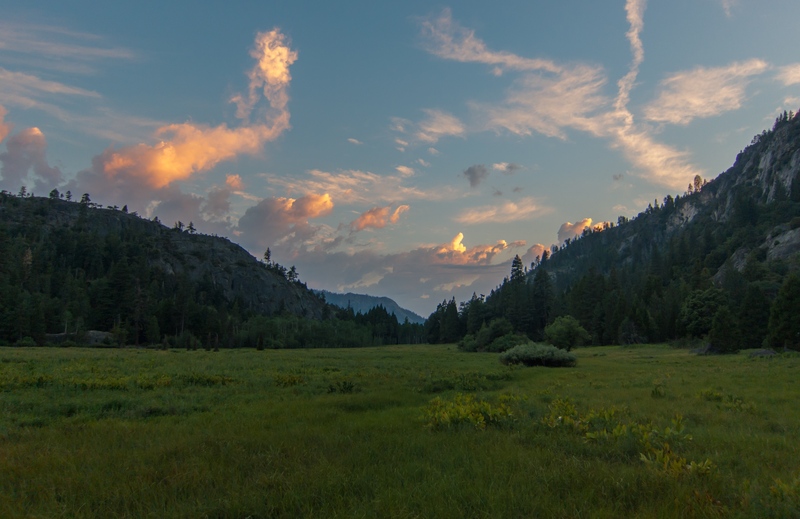 The trail took us strait across the valley through tall grass, marshy ground, and a thick cloud of mosquitoes that were un-phased by the DEET. We moved quickly! Rancheria Falls was a tent city. This must have been the staging area for the trail crew. 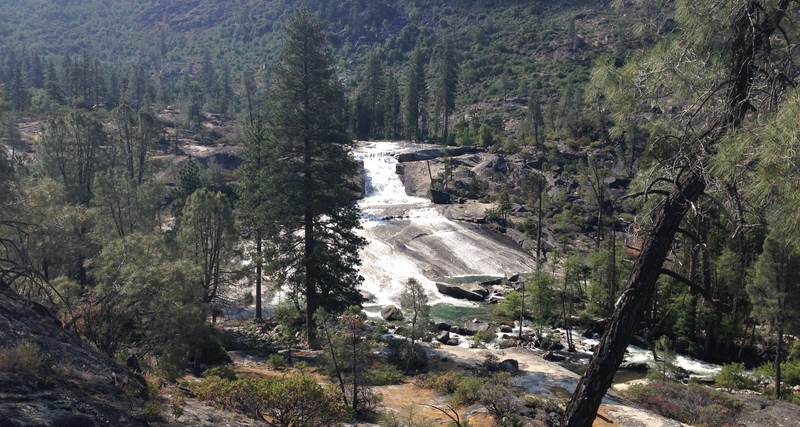 From the falls, the trail moves above the shore of the reservoir several miles before returning to the dam. This was probably the most scenic stretch of the trip with many great views of the valley and crosses a couple waterfalls. It was a great stretch to finish the trip on! Don’t miss the first part of this trip! Find more photos on Flickr! 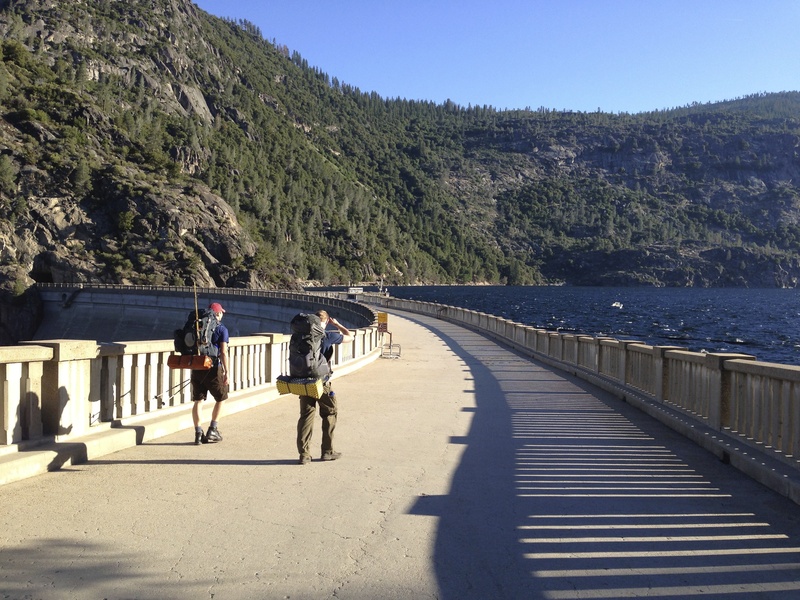 We rolled into Hetch Hetchy Friday evening just before the gates closed at 9PM. After grabbing our permit, we made our way to the backpacker camp. It was warm and the sky was clear as we set up camp for the night. The weather for the weekend was supposed to be hot, so we were planning on getting an early start to beat the heat. I woke up with the sun at about 5:30AM. Hugues and Paul arose shortly after and we hit the trail by 7AM in an effort to climb out of the reservoir valley before it got too hot. The wind was blowing hard across the reservoir as we crossed the dam and started up and out of the valley at 7:30AM. The temperature had already reached 80°F! The climb out of the valley was steep and hot, but we made it to Beehive by 10AM. From here we took a short detour to Laurel Lake for lunch and a swim. At this point the temperature had reached 95°F. I was the first one in the lake and the water felt amazing! After a swim and some lunch, we continued towards Lake Vernon. Much of the trail was through forest recovering from a wild fire several years ago. The recovering forest had a fair amount of standing water to support enough mosquitoes to keep us moving at a quick pace. 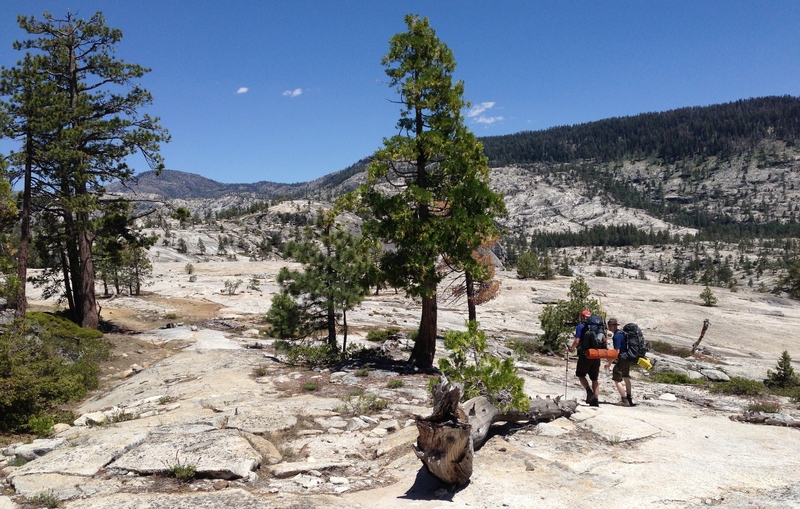 As we approached the hottest part of the day we cleared what remained of the forest and made our way across granite slab with sparse tree cover. The sun was beating down hard, but we were getting close to the lake where we would set up camp for the night. Once at the lake, it wasn’t long before we found a nice campground with a fire ring in a small cluster of trees. We dropped the packs and headed for the lake. 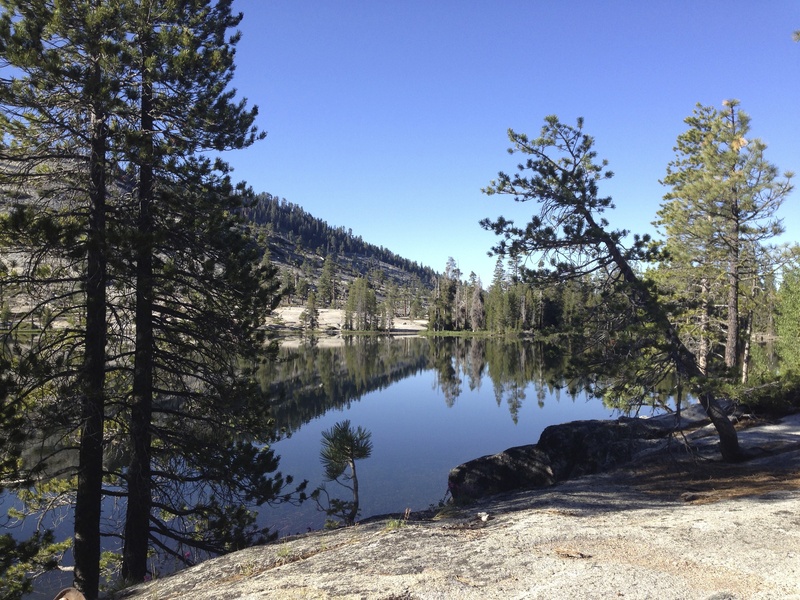 Vernon was a bit colder than Laurel Lake, but after hiking in 95°F weather it was just the refreshing swim we needed! After a swim and some lake side relaxation, I made my way back to camp to set up my tent and take a much needed nap. It was still early when I started preparing dinner, but I was baking pizza so I needed the extra time. This was the first trip in CA that I was able to build a twiggy fire on my Fry-Bake because of the ever-present fire restrictions, so I took advantage of it! 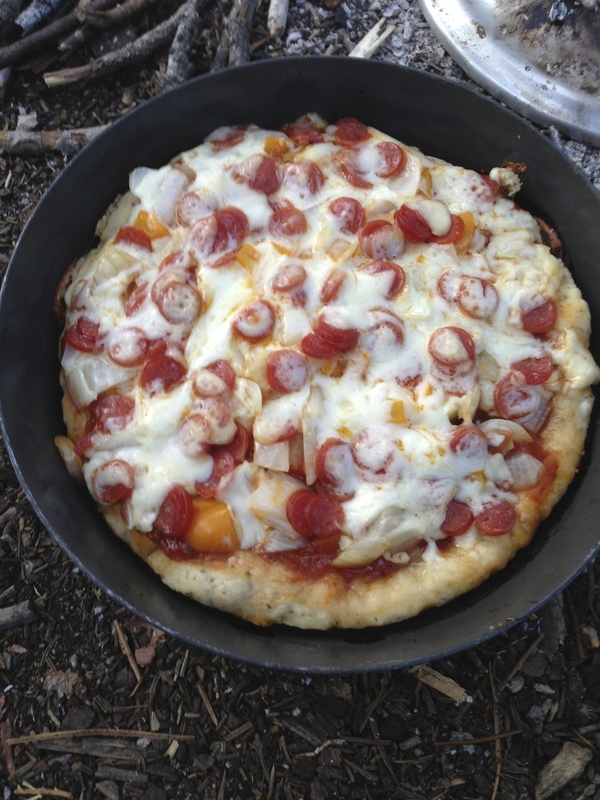 After baking to perfection, I chowed down on a pizza in the backcountry! As the daylight faded, we managed to clean up from dinner just before the mosquitoes attacked… The sun had just set, the wind died down and the skeeters came out in full force! 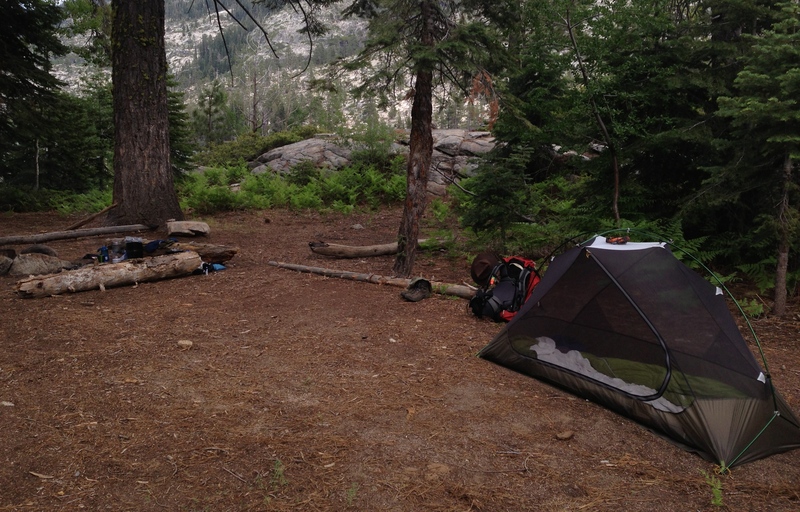 Even my 100% DEET didn’t seem to phase them, so we retreated to the tents for the night. Find more photos from this trip on Flickr!